The capital of Perak state in Malaysia, Ipoh, is at a distance of 200Km from Kuala Lumpur. Ipoh was founded in 1820s as a village but was rebuilt after the great fire of 1892. Early 20th century was a turning point for Ipoh, when more British tin-mining companies were setup in the city. This helped Ipoh get prominent in the map of the country. During the period of Japanese reign, it was made the capital of Perak instead of Taiping and to this date it still remains the capital of Perak. While in Ipoh, tourists can enjoy white water rafting at Kampar River, which passes through the mystical and beautiful rainforest of the region. The other main attraction to the tourists is caving; they can visit Gua Tempurung, which is the largest limestone cave in Malaysia. Tourists can also go hiking by following one of the many trails on the hills of Menglembu-Kledang. While on those hills, no one can miss the outstanding view of the limestone mines that surrounds the outskirts of Ipoh. There is also a chance of exploring the rainforest of Ipoh in Ulu Geroh. Here you can see the world largest flower named Rafflesia and a nice natural view of a small but beautiful waterfall in the jungle. For golf lover, many golf courses in Ipoh can be found to practice or test your golf skills. Like other cities in Malaysia, Ipoh is also full of historical monuments and landmarks. Ipoh Railway Station is one of the three railway stations that were built by British in the Malaysia railway network. It is also known as the “Taj Mahal of Ipoh” just because of its beautiful design. Then you can visit Muzium Darul Ridzuan, just to look at and inspire from the historic artifacts and cultural artifacts of the region of Perak. 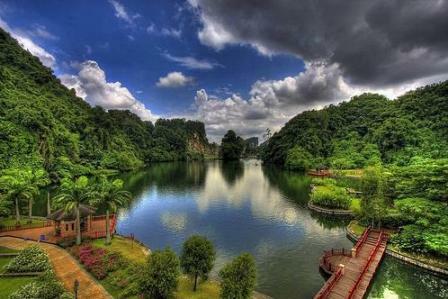 If tourists are fond of evening walks in parks then Ipoh has the right gift for them, Padang Ipoh (Ipoh Green) is the best place to have a peaceful evening stroll. It is a large lawn with green grass and surrounded by tall but beautiful buildings. Around Ipoh, tourists can also find the cave temples where they can find statues and murals of that particular religion to that temple belongs. Some of the most popular cave temples are Sam Poh Tong and Kek Lok Tong. A wonderful theme park hotel with hot springs and spa facilities. Located in the city centre of Ipoh with Kinta River view and a range of pubs and restaurants. A cosy, clean and centrally located hotel. Enjoy the space and pleasant customer service, great for family vacation. Visitors can get in to Ipoh by air or by land. Air travel in Ipoh is served by Sultan Azlan Shah Airport, which operates daily domestic and international flights. Visitors can also visit Ipoh by train, coach or with their own transport. For international visitors, car rental companies can be found in the airport and city area easily. Touring around Ipoh is easy as there are plenty of taxi and bus companies operate in the city as well as at the outskirt areas. Visitors can also walk if they prefer or rent a bicycle for a day to explore the city in a different way.